The memory: lightly fried clams with big, juicy bellies, like the kind I munched on nearly every summer weekend growing up in Swansea, Mass. The car, owned by my friend Bob Pidkameny: a nod to my godfather, a local celebrity and stock car driver, who would pile my two cousins and me into whatever sleek beauty he was tinkering with and take us to Macray’s in Westport, Mass. There we sat—three lard slicks—digging into red-and-white cardboard boxes, while screams from the riders on the Comet, the wooden roller coaster at a nearby amusement park, floated across the highway. 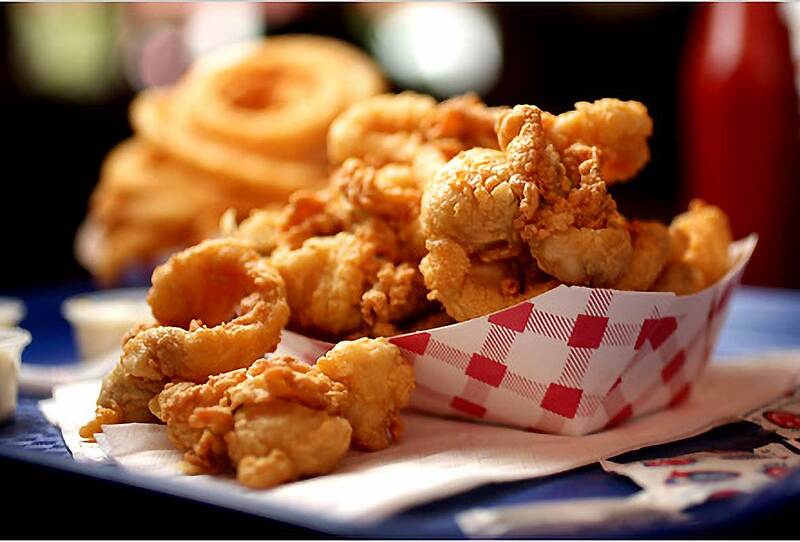 Fried clams are to New England what barbecue is to the South. Like barbecue, the best clams come from small roadside shacks run in pragmatic mom-and-pop style. Flinty Northerners, like their porcine-loving counterparts, can be fanatically loyal to their favorite spots. To eat at any place but Macray’s was considered familial treason when I was growing up—it was Macray’s or nothing, until it was shuttered and we were set adrift. This summer, in search of the fried clams of my youth, Bob and I covered more than 625 miles, visited 16 shacks and unashamedly basked in the attention the Thunderbird commanded from Branford, Conn., to Portland, Me., and back. In between rolls of antacid and scoops of ice cream, the unofficial finish to a fried-clam meal, we found that this summertime classic is even more fleeting than the season of its peak popularity. Storms, public taste, government warnings about saturated fats, even school vacation schedules conspired to keep the clams of my memory mostly out of reach. But every once in a while, fate jiggered events and passed me a pint or two of the luscious, plump-bellied beauties I remember. To many New Englanders the humble clam, which stars in chowders, clambakes and clam cakes, reaches its quintessence when coated and fried. And ever since July 3, 1916, when Lawrence Woodman, a k a Chubby, the founder of Woodman’s in Essex, Mass., fried a clam in lard normally reserved for his famous potato chips, cooks have been trying to create the perfect fried clam. But unlike pit masters who rabidly guard their secret sauce recipes, fry cooks are an open book. All work with the same four elements: soft-shell clams, a dipping liquid, a coating and oil. According to almost all the cooks and owners I met the liquid is usually evaporated milk, and the coating is nothing more than some combination of flours: regular, corn or pastry. Most places use canola or soybean oil, which are high in unsaturated fats. Only Woodman’s and Essex Seafood, in Essex, Mass., still fry clams in pure lard. So why are the fried clams I dream of so hit-or-miss? “I’ve been doing this for 21 years,” said Dave Blaney, owner of the Sea Swirl in Mystic, Conn., “and the hardest part is training the new kids.” He explained that it takes two weeks to train summer help, usually college students, but it requires almost two months of supervision to turn them into bona fide fry cooks. He warned me about visiting shacks too early in the season (when the students are gearing up) or too late (when the exodus occurs, and deep-fryers can be left in the hands of most anyone—the owners’ sons or daughters, say, or the cleaning help). Improperly cooked clams can range from oil-laden to burned. Indeed, the Clam Shack in Kennebunkport, Me., a favorite place I’ve been recommending to friends for years, presented Bob and me with a pint of puny dark-brown clams that tasted faintly of burned liver. Champlin’s Restaurant in Narragansett, R.I., another well-regarded spot, served clams so overcooked we dumped them after eating only a few. In both places, the kitchen crews looked like a cast from “The Real World” on MTV. The Sea Swirl’s fried clams, on the other hand, were golden, with a light crunch, and the bellies, while on the smaller side, were plump and filled with ocean flavor. What caught my attention was that the siphons, or “necks,” were snipped off. That made for a soft chew, without the rubber-eraser bite common to most fried clams—even, I must admit, those from the hallowed boxes I remember at Macray’s. I asked if this was a customary practice of purveyors. “No, I snip them here,” Mr. Blaney said. “Otherwise I’m at the mercy of the supplier, and I can’t afford that.” Of all the places we visited, only the Sea Swirl offered completely snipped necks; the others sold clams with just the tops nicked off. This snipping, though, shouldn’t be confused with the iconic, and tasteless, clam strips featured on every Howard Johnson menu in New England. These impostors can be as varied as de-bellied steamers—a rarity—and slices cut from the “tongue” of the larger multipurpose Atlantic surf clam. No strip has the oceanic flavor of a true steamer with its belly firmly attached. It was later that day, after leaving two small Massachusetts shacks empty-handed, that we understood just how much weather influences what we eat, or rather do not eat. As a result of several days of heavy downpours and runoff earlier in the week, the clam flats, the most highly prized of them off the coast of the state’s North Shore, specifically Ipswich and Essex, were closed. The water can take several days to normalize after a big storm, according to Curt Fougere, a great-grandson of Chubby Woodman and the manager of Woodman’s. That’s why those smaller spots, which don’t sell as many clams as Woodman’s, had to turn us away. Larger places with purchasing muscle can buy from Cape Cod or even as far away as Maryland and Canada, but none of those clams have the Ipswich richness, a byproduct of the nutrient-filled mud. “Cape Cod clams tend to be gritty,” Mr. Blaney said, “because they come from sandbars rather than mud flats.” Maryland steamers, while deliciously large, are too soft, he said, and break apart while cooking. Maine clams are considered the closest to Ipswich clams, and are the most common substitute. In between shouts from classic car enthusiasts along Route 1, Bob and I theorized about the reasons for the dearth of the big-belly clams. We batted around global warming, pollution, disease, but none seemed likely to have knocked out only the pudgy clams. No, the biggest threat, we discovered, was far more menacing: fashion. 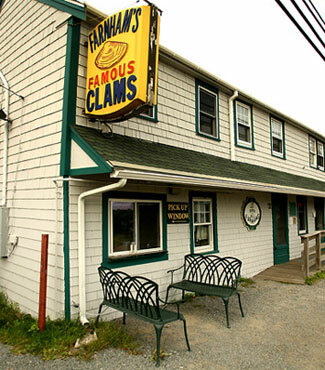 “Clams kind of go through cycles,” said Terry Cellucci, an owner of J. T. Farnham’s, one-third of the famous Essex clam shack trifecta that includes Woodman’s and Essex Seafood. For years, she explained, smaller clams have been in vogue. “Right now that’s what our customers like, so that’s what we buy.” The same was true of most every place we visited. The clams at Farnham’s fried up dark golden and pleasantly crunchy but were missing that burst of juicy belly brininess. As we pulled up outside the Clam Box, eight miles northwest in Ipswich, Mass., the first thing we noticed—aside from the whimsical roof that looks like (what else?) an opened clam box—was the line snaking out the door. It numbered more than 20 and according to the owner, Marina Aggelakis—known to all as Chickie—had started forming, as always, 30 minutes before opening. Taking Ms. Shohet’s advice, I searched the huge menu above the order window and found the one line of neat, tight printing I was hoping to see: “Big belly clams available on request.” The Clam Box was the only shack on our trip to offer up this critical piece of information unbidden. “You’ll only get about nine,” she said. She tried once more to dissuade me, but I resisted. When my number was called, a tray was pushed through the pickup window: on it was a mound of golden clams with bellies so big and soft the coating was chipping off. The necks, though not trimmed like those at the Sea Swirl, had none of the elastic bite I had encountered in many pints along the way. And the bellies dripped sweet, briny clam juice down my chin. To pull this all off, Ms. Aggelakis uses only Ipswich clams unless bad weather or high demand causes her to turn to Maine suppliers. She also double-dips her clams while cooking. Excess coating stays behind in the first deep-fryer, allowing for cleaner cooking in the second. In addition, she closes the restaurant between lunch and dinner—unheard-of—to change the oil, ensuring a clean taste all day long. It was an offhand comment, though, that gave me the final piece of the puzzle: darker-fried clams, she said, have a nuttier taste, while the lighter version lets the clam flavor predominate. Bingo. “I like to please my customers,” she added. “Some like them big, small, lightly fried, dark—we give them what they want.” Funny, the concept of requesting anything special at a clam shack’s takeout window had eluded me for 40 years. Putting together the experience from the trip, I decided to try my hand at customizing my meal at Lenny’s Indian Head Inn in Branford, Conn. First, I called ahead because we had had two days of steady rain. The clams were frying. When I ordered, I asked the waitress, a bubbly young woman, if the restaurant had big-bellied clams. She wasn’t sure, so went to ask the cook. She returned deeply crestfallen. All he had, she said, was medium-size, “but he’ll try to pick out the biggest ones.” Equally crestfallen, I agreed and asked for them to be lightly fried. What was placed in front of me 10 minutes later was a platter with clams nearly as large as those at the Clam Box. They had a light golden almost tempura-like coating. And the bellies? They were briny, sweet and so juicy a lobster bib wouldn’t have been out of the question. I could almost hear the screams from the Comet again. Originally published August 29, 2007. Photo © 2007 Erik Jacobs. All rights reserved. Three years ago, the hubby and I were visiting rellies in Worcester, Mass. (he’s a New England boy like you) when we decided to take a driving tour of the coast road towards Ipswich. It was 10.30 in the morning, and I recall that we had just decided that we would have a late lunch, as we were still full from breakfast. Thirty second later, the Clam Box shack swings into view, and I screamed “Pull over! Stop there! Fried clams! !” Hubby screeches into the carpark, all the while shouting, “There’s a queue forming! It must be good! Quick run! !” 15 mins later saw the both of us hurrying to a table, laden with fried bellies, strips and a pile of scallops. David, it was close to a religious experience–reverential silence apart from the slurping and chomping, eyes fixed onto something in the middle distance and glazed over – it was the most perfect fried clam/seafood moment of my life. Even as I am writing this now, I can STILL taste the sweet, fresh brininess, the perfect light, greaseless crust–enough to make me up sticks from Singapore and decamp permanently. Ling, I totally, 100 percent understand. 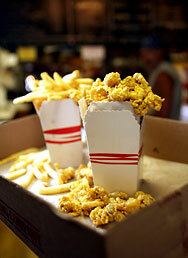 In fact, when I go up north one of my very first stops is the Clam Box. Bereft of that, another fried shack. I think fried clams get really short shrift in American regional cuisine. I believe that they deserve to be right up there with fried chicken and barbecue. It’s those darn Ipswich clams, I tell you. They should get the equivalent of a DOC/AOC. Matchless. Argh, now the hubby is begging for clam chowder… I’ll make him your clams cataplana soon, see what he makes of that!! You’re totally right. These clams, unlike those in Cape Cod and other places, grow in mud flats. It gives a mineral-y, earthy flavor to the bellies. Thanks for the addition, Susie. I’ll have to check it out next season. After reading this article, here I am sitting at my kitchen table I feel compelled to jump in the car and head straight to my favorite clam shack! But it’s finally cooler weather and I have yard work to do. But I will get clams as soon as I can! Lorna, when you do, post a comment and pictures. I’m trying to make fried clams as beloved and as desired as barbecue. I always enjoy reading your David Blahgs – even if they are repeats. More! More! David, this article brought tears to my eyes, so vividly did it evoke memories of youthful summers on the Cape. Spending much of my life careening around the northeast, I can fully appreciate your quest for the perfect fried clam. I live in Southern Maryland now, and I fully intend to try out the Clam Shack Style Fried Clams with our local steamers. Thank you! Why, thank you, Kristen! I appreciate your kind words. And do check out the Clam Shack. You won’t be disappointed. Tell Chickie I sent you. I’m from Portsmouth, NH, and miss Ipswich fried clams….love them and lobsters. Used to get clams from El’s when I was a kid. I hear you, Sandy. Are you not able to get back to Ipswich?